Not to confuse with the public radio station, research at NPR is focused upon the sensory encoding and processing of the peripheral nervous system. 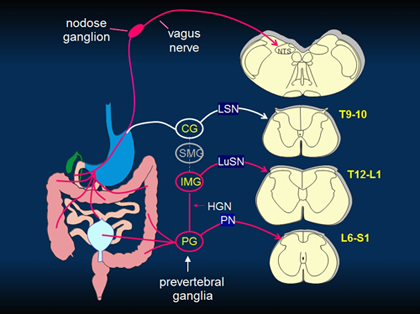 Particular interests are given on 1) how the sensory afferent neurons detect and transmit pain-related sensory information, 2) the peripheral mechanisms that underlie the sensory aberrations in chronic pain and 3) translating scientific discoveries into next-generation neuromodulatory strategies and devices that target peripheral nerves/neurons for the better management of chronic pain. We are focused on but not limited to the study of visceral pain, i.e., pain arising from the internal organs. We employ a multi-disciplinary approach that includes 1) experimental studies on the sensory nerve endings by in vitro electrophysiology and biomechanics of visceral tissue, 2) state-of-the-art molecular biology and generic knock-out/knock-in mouse models, and 3) computational simulations and rigorous mathematical analysis that integrates the experimental findings to deepen the theoretical understanding of visceral afferent encoding and sensitization. As biomedical engineers, we are also enthusiastic in engineering the next generation tools for neuroscience studies in general and visceral pain management in particular. NPR is hiring! One position available for a PhD student with graduate research/teaching assistantship. If interested, please contact Dr. Feng directly (fengb@uconn.edu). Feb 2019: Dr. Feng (PI) has received a $560K NSF CAREER award entitled "Understanding peripheral neuromodulation to enhance non-drug management of chronic pain". June 2018: Drs. David Pierce (PI) and Feng (co-PI) received a study grant from Unilever Inc..
Feb 2018: Drs. Feng (PI) and Phil Smith (co-I) at UCH received a $160K NIH R03 grant entitled "Mechanisms of DRG stimulation to modulate visceral afferent function". Dec 2017: Drs Martin Han (PI) and Feng (co-I) received a DoD grant entitled "Focused ultrasound neural stimulation for spinal cord injury". Sept 2017: Drs. Feng (PI) and David Pierce (co-PI) received a $430K NSF grant entitled "Understanding the multiscale mechanics of nerve endings to address visceral pain". Mar 2017: Our undergraduate Dhruv Shah has received the $3,300 Summer Undergraduate Research Funds (SURF) from UCONN. Congratulations! Feb 2017: Our undergraduate Dhruv Shah is among the top 5% applicants to be accepted into the prestigious Harvard Summer Research Program in Kidney Medicine (HSRPKM). Congratulations! Oct 2016: Drs. Feng and Santaniello from UConn BME hosted the 20th Annual Neuroscience at Storrs mini symposium. Sept 2016: Dr. Feng (co-PI) and Dr. Lucas (PI) at UCONN School of Nursing received the CT Bio Pipline grant ($30K) for their project titled "A low cost portable device for breastfeeding diagnostic". Aug 2016: Dr. Feng (PI) received a study grant ($114K) from Allergan Inc. to investigate the role of eluxadoline in treating IBS-related visceral pain. July 2015: Dr. Feng (PI) had his NIH K01 grant transferred to UCONN and started the NPR lab.